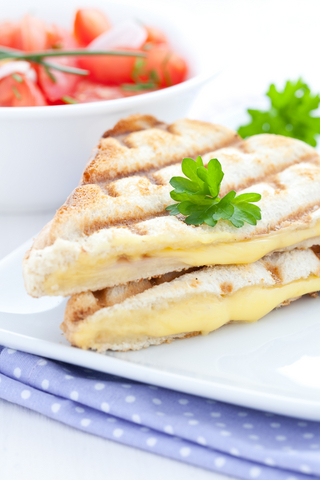 Just about any grilled cheese sandwich is improved by the addition of some fresh fruit or vegetables. Apples, tomatoes, spinach, zucchini or Bermuda onion are my top choices. My kids love sliced apples! I always grill in grandmothers 100 year old cast iron fry pan using butter. Travel tip: I have yet to walk into a restaurant whether it be a burger joint, steakhouse, chinese buffet or Dairy Queen that could not to make me a grilled cheese and tomato sandwich – just ask. I am always looking for new ideas, so please if you know of other great combos, send it this way!